It has been awhile, but once again we find ourselves in another war. The IDF (Israel Defence Force) and Israeli nation are standing strong but it is still a sad time here in the holy land. Not only are we vilified in the international press for protecting ourselves, but too many young soldiers are dying defending us. Sorrow of course is sadly not uncommon to the Jews. There is even a date, Tisha be'Av, that runs like a disastrous thread throughtout the Jewish history. * In 586 BCE the First Temple was destroyed by Nebuchadnezzar of Babylon. One hundred thousand Jews were killed and the majority of the population was exiled. * In the year 70 CE the Second Temple was destroyed by the Romans under the leadership of Titus. This time two million Jews were killed and one million were exiled. * In 135 CE the Bar Kochva revolt was ruthlessly crushed by the Roman Emperor Hadrian. More than one hundred thousand Jews were killed. * The Roman general Turnus Rufus leveled the Temple area and rebuilt Jerusalem as a pagan city. It was called Aelia Capitolina and Jews were forbidden from entering. * The first crusade officially began in 1096, 10, 000 Jews were killed. * After many Jews have been tortured throughout the Spanish Inquisition, they were finally exiled from Spain on Tish B'Av in 1492. * In 1914, on the eve of Tisha B'Av World War One broke out. * In 1942, Jews were being mass deported from the Warsaw Ghetto to Treblinka. If you look at all these dates throughout the years, it seems as if the date of Tisha B'Av is some sort of magnet for misfortune. One wonders what the cause can be for so many bad things to happen on the same date. The answer lies even further back into the Jewish history. All the way back to when the Hebrews were crossing the desert. Ten spies were sent into the land of Israel to give a report about what awaited the Jews in the Promised Land. It is taught in the Talmud that the first Tisha B'Av was the seed for all the future tragedies that happened in the history of the Jews. It was on Tisha B'Av when the spies told the people that ""We cannot go up to the people... They are too strong for us" (Numbers 13:31). When they heard the report of the spies, the Jewish people wailed a collective cry and decided not to enter their promised land. But why was the sin of the spies dealt with so harshly? The spies slandered the promised land and the Jews showed a big lack of faith. Instead of placing their trust in God, they wrongfully asked to spy it out. God told them that they would succeed in conquering all opposition but they believed the spies' reports that the giants in Israel were invincible. For their punishment, these Jews had to continue to wander the desert. Only their children and grandchildren were deemed worthy to enter the holy land. 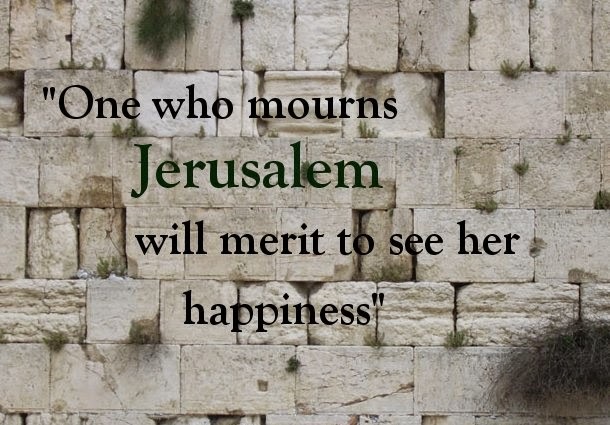 Today Tisha be'Av is mourning day. Jews refrain from 'fun' activities such as going to a restaurant, going to the beach or swimmingpool. They do not start a new venture or business deal, many also fast and pray the entire day. I believe that everyone can learn something from the sin of the spies, non-Jews included.This date reminds us that life is not easy. A lot of bad stuff happened to the Jews, but you know what - they are still here. There is war now in Israel, but I also know that there will also be peace again.To achieve greatness, you have to take risks in life. Do not settle for an easy complacent life, God wants us to excel and achieve greatness. Don't keep on hanging around in the desert when know it is time to enter your own personal promised land. And have a bit of faith!